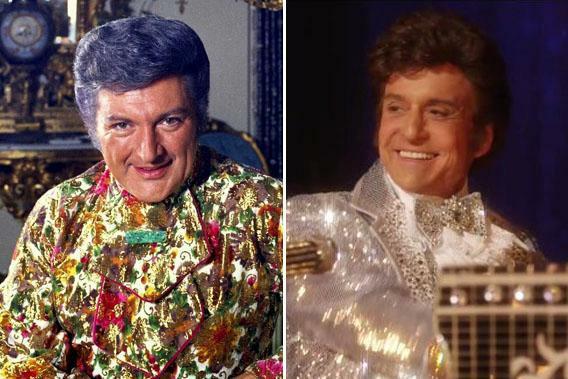 Liberace movie Behind the Candelabra: True story? Fact and fiction in HBO's Michael Douglas movie. How Accurate Is Behind the Candelabra? Liberace and Michael Douglas as Liberace. Steven Soderbergh’s HBO movie Behind the Candelabra chronicles the turbulent five-year romance between famed concert pianist Liberace (played by Michael Douglas) and his young lover Scott Thorson (Matt Damon). Based on the 1988 memoir by Thorson, the film unveils the lavish lifestyle of the performer and the intimate circle of friends, lovers, and businessmen who surrounded him. This version of Liberace dons wigs, showers affection on Scott, and shows no shame about his sexuality—at least behind closed doors. How closely does Soderbergh hew to Thorson’s story of life with Liberace? Pretty closely—though the accuracy of Thorson’s book itself is another matter. (Thorson has served time for burglary in the past and was recently arrested again on similar charges.) Below, we’ve taken a look at a few key characters and events to see just how faithful the movie is to the book. According to Thorson, Liberace’s mother Frances (Debbie Reynolds) pushed him hard to practice the piano as a child, forsaking playtime with other kids—and the film presents a similar story. These accounts differ, though, from Darden Asbury Pyron’s 2000 biography, Liberace: An American Boy, which suggests that as a child, the future star was more than happy to practice on his own (“His parents could not tear him away from the upright in his parlor”) and didn’t seem to mind not having friends. Thorson’s friend Bob Black (Scott Bakula), a choreographer-dancer, invited Thorson to see Liberace’s show during a trip to Las Vegas, which led to their meeting backstage afterwards, as the film depicts. Liberace has a protégé at the time called “Jerry O’Rourke” in the book; in the movie, his name is changed to Billy Leatherwood (Cheyenne Jackson). Like his real-life counterpart, Billy is immediately unhappy about Scott’s arrival. Billy/Jerry is married—after seeing him play in a piano bar, Liberace offers him a performing contract with the caveat that he leave behind his wife and kids, according to the memoir—and by the time Thorson is in the picture, his relationship with Liberace is already on the rocks. In Soderbergh’s account, he moves out of Liberace’s mansion the day Thorson arrives; the memoir says that that Jerry stayed, despite everyone’s discomfort, for four more months. After discovering that Liberace had cheated on him, a furious Thorson left the Vegas mansion for the penthouse Lee bought for him. In his memoir, Thorson says this led immediately to his eviction, that Seymour Heller (Dan Aykroyd), Lee’s agent and manager, plotted to “remove [him] from Lee’s life—permanently” while he slept that night. He is soon confronted by a private investigator and a few assistants, who attempt to get him to leave and suggest he go to a hospital to seek addiction treatment. Thorson doesn’t cooperate until realizing he has no other choice. As in the book, he agrees to leave the penthouse and come back to get his things later, after Lee has left for the 54th Academy Awards. Thorson gives a detailed retelling of the lawsuit he filed against Liberace, while Soderbergh condenses the years-long legal battles to a few short scenes. A title card jumps to the year 1984, and then we see Thorson and his lawyer Felder (Paul Reiser) discussing possessions and legal documents with Lee’s lawyers. Felder tells Thorson that he’ll get $75,000 in cash, three cars, three dogs, and all of his clothes if—and only if—he signs over the title of his house, all of its contents, and three specified cars. * This is recounted exactly in Thorson’s book, though, according to him, the agreement was settled on in 1982, before he officially filed a lawsuit. Thorson reluctantly agreed to sign it because he was “desperate for money” at the time. As recounted in the Thorson’s book and elsewhere, Liberace’s cause of death was first described as cardiac arrest caused by cardiac failure, but the death certificate was rejected by the County Health Department. Heller (and Liberace’s lawyers) maintained that he died of heart failure, but because California law required that all suspicions of contagious diseases be reported to the coroner’s office, an autopsy was performed. After taking tissue samples from his embalmed body, Liberace’s death by AIDs was confirmed. By Thorson’s account, the day of Lee’s funeral was a beautiful one, though the ceremony itself was rather “drab,” unfit for someone who lived as lavishly as Liberace. The final scene in Soderbergh’s adaptation brings to life the funeral Thorson felt his former love would have appreciated: a Rolls Royce, “a sarcophagus draped in his favorite fur,” and Thorson himself in a fox cape with a 16-foot train. It’s a fitting—and accurate—tribute to Liberace’s memory. How Faithful Is The Great Gatsby? * Correction, 3:21 p.m.: This post originally said that Liberace would receive the $75,000, the three cars, and the three dogs.